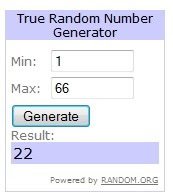 So I know the Expressions Vinyl Giveaway for a $25 gift certificate was at the beginning of the month and I said the winner only had 48 hrs to contact me, but I completely forgot to pick a new winner! Definitely think it is time to pick a new winner, especially since the winner has had 3 weeks to contact me. Wahoo! :) I'm so excitied! :) I'll email you. Thank you!